Category: Who is using FB? In this next installment, we’ll be looking at two (arguably very contrasting) databases. The first is Gladius DB, which is a flat file database written in pure PHP. The second is Firebird, another database veteran, which has features similar to some of the better-known databases, such as Microsoft SQLServer. So with that, let’s get going. You can read more about it from Wikipedia and the announcement from it’s mailing list , and the thread that discussed about Firebird support. Firebird on virtual servers anyone ? Firebird on virtual servers anyone? I am aware that some IT depts are using virtual servers and I wonder if anyone here has experience of FB on this type of configuration. It looked like a good idea because I did not have to care with users management, but I have now realized that using SYSDBA for database development can cause problems when the database is deployed to the customer’s computer. We run Firebird to power larger systems (for 12 government agencies and 3 banks). It has approximately 100000 end users multiplexed through 2500 (max) pooled connections. Chipsets that can handle 2 TB of RAM and 8 CPU sockets (<=80 cores, <=160 threads) are the largest “commodity” type hardware available now. These are the largest systems we worked on. 8 GB of lock manager space per database should be just enough for them. With the allocation error check in place we’ll have this problem solved for the next year or two until larger systems become common. Phacil has an anticipated need for a Project Manager (Senior) for an important government customer in Sterling or Arlington, VA. Experience project managing large IT projects including cost, schedule and performance management is required. Experience managing the execution of project tasks, Risk Management, Quality Control (QCP) and communication management are required. Experience managing the system administration, training and support for the Firebird database management system is required. Conducted trainings on FIREBIRD system with users. I have a server with 16 cores. What do I set the CpuAffinityMask to? 1111 1111 1111 1111 is 65535, should I put 65535? Also, how to I configure the SuperClassic server? This is for Firebird 2.5. Another thing to keep in mind while securing your database: sometimes when we release new versions of Fishbowl, it upgrades your database to a new version, as well. When this happens, Fishbowl makes two different backups. One is a copy of the database; the other is a Firebird database dump. I like to call these the “Murphy’s Law backups” because you shouldn’t need them, and you won’t need them – until you don’t have them. They are created for rollback purposes during the upgrade. Leaving these unprotected is just as bad as leaving your main database unprotected. You can find these files in C:\Program Files (x86)\Fishbowl\database\data – inside the “old” and “backup” directories. A new case-study was added to FirebirdSQL site. 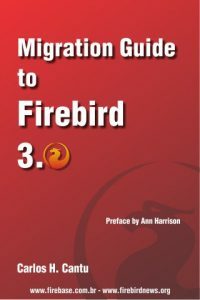 It is always interesting to ready such articles, and know about other companies experiences with Firebird. This time it is about DRB Systems moving from InterBase 6 to Firebird to solve stability problems. Read more.